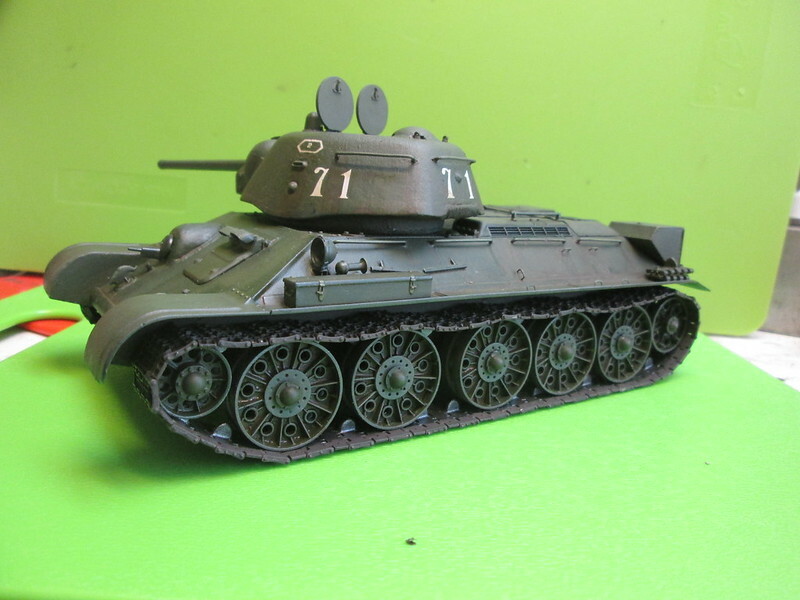 Still trying to use up some of these oldies, mostly just collections of pats, I dug out three Tamiya T-34 boxes, and actually found enough parts to build a complete model. 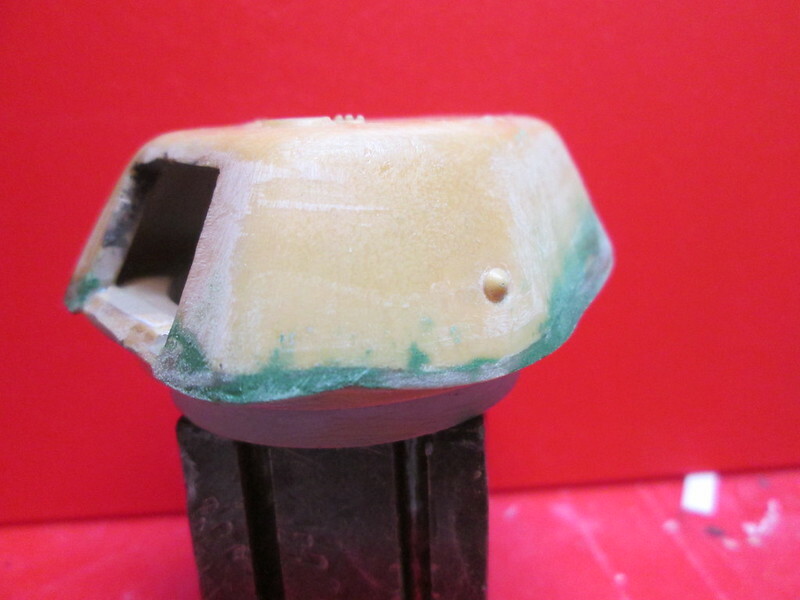 It also gave me an excuse to use an old Uralmash turret, something in resin from a long out of business company. 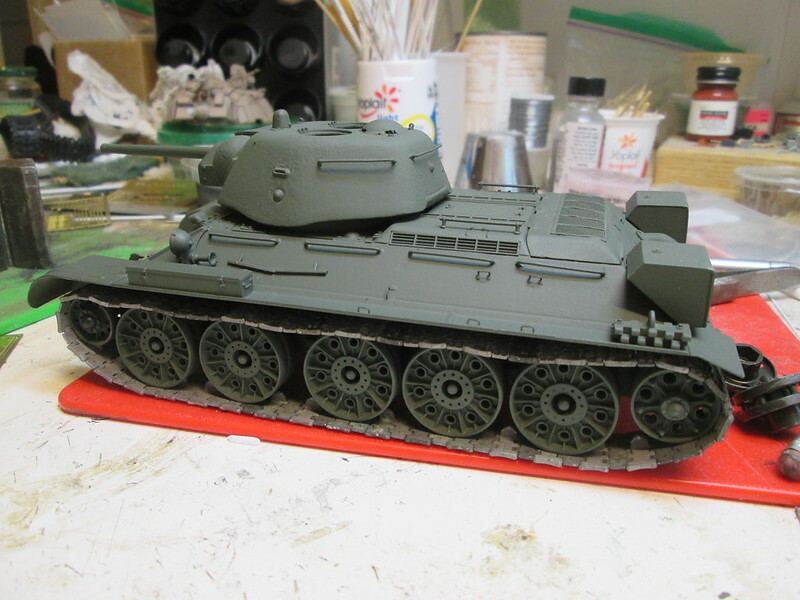 I also found several frets of DEF PE for various T-34 models, so I'll try and use up some of that too. 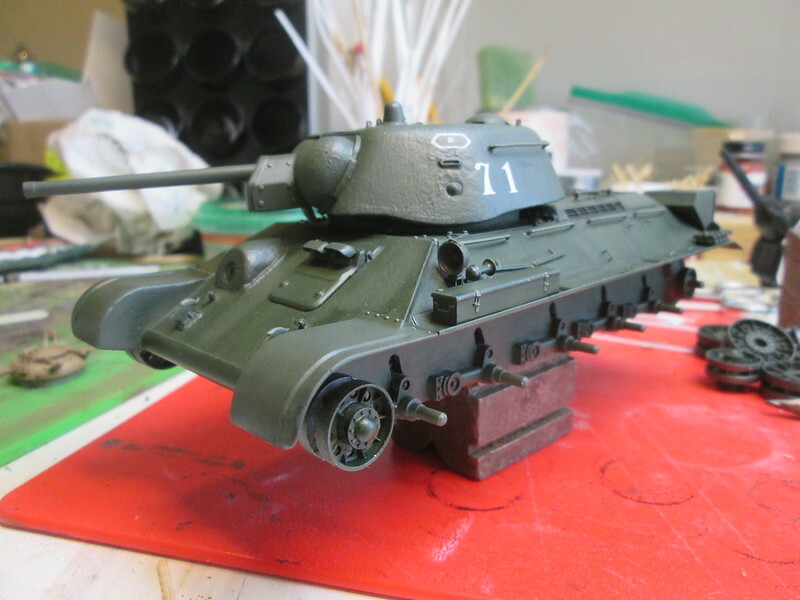 What I hope to end up with is something I only have a line drawing of, a Model 1943 T-34/76 with the goofy Uralmash stamped turret and all-steel roadwheels. 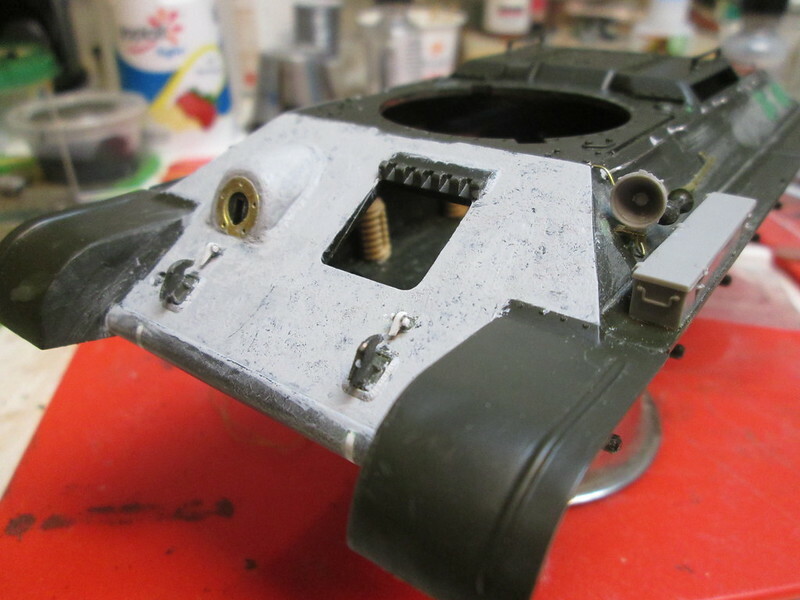 I'm doing a little detail work on the lower hull too, cutting the slots for the swing arms and using some old Merkava springs to at least make it "look" right, and beefing the final driv housings. 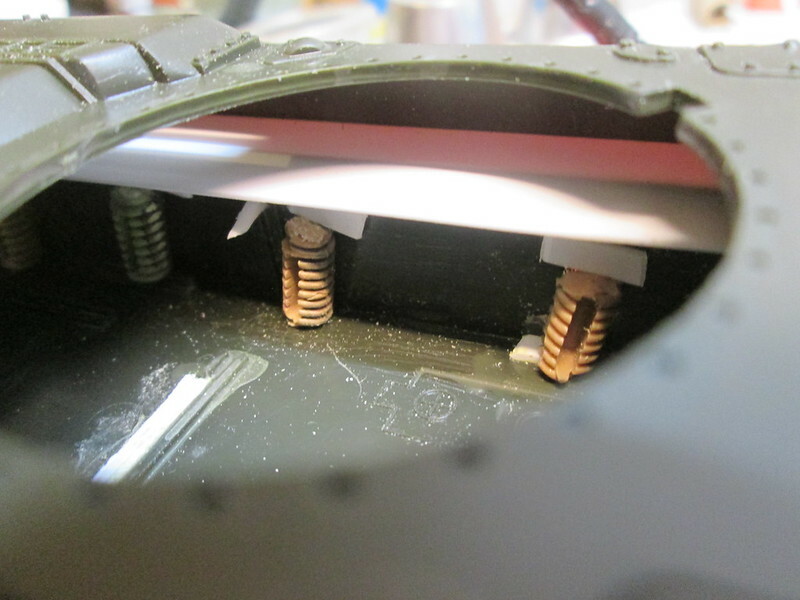 Also, I plugged numerous holes and boxed in the area below the cooling vent louvers, to be added. I realize it's a lot of work, but I will have a pork-skin purse when I'm done, and I have to confess, I really like this kind of modeling. Call me crazy, but I'm having fun. 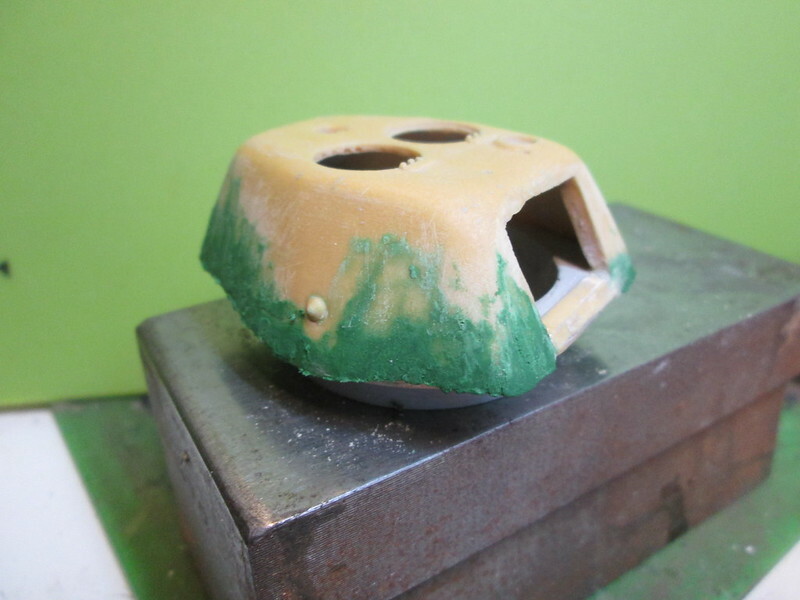 So a quick shot of the turret, extra green stuff sanded off, and one of the textured turret, gun mounted, on the hull as it is now. Wow. That must be a lot of Mr.Surfacer. BTW, how is Mr.Surfacer? I've heard a lot about it looking around forums and the internet. Oh wow, this is gonna be cool!!! I often buy up odds and ends of kits and then cobble something together. That way, I don't "ruin" a good kit as I try something new. 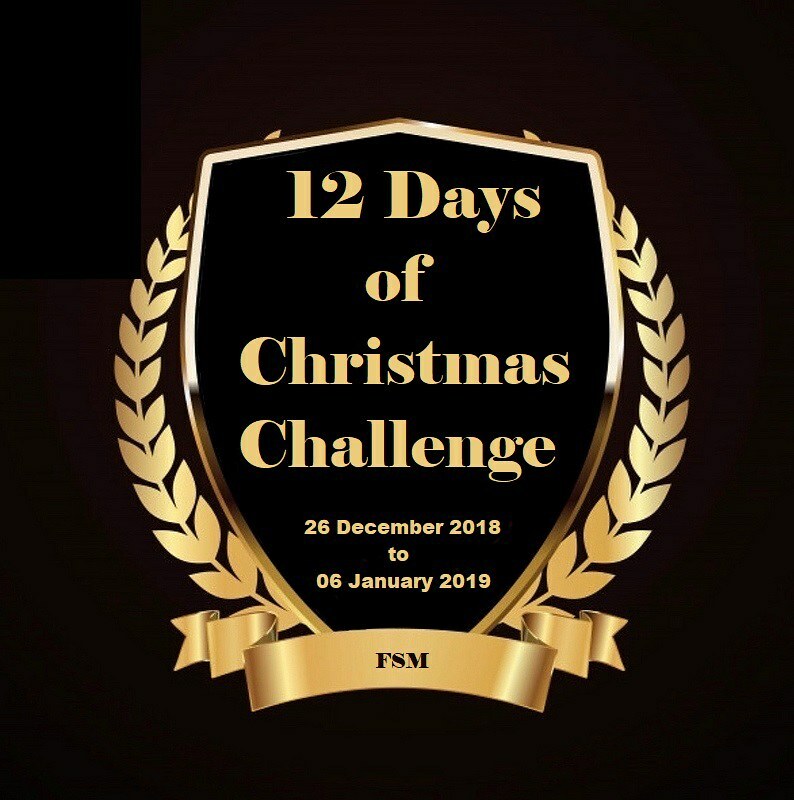 It looks good, have fun with it. I know I have fun when I create a nice kit out of scraps. G- I use a lot of it, always keep a jar of the "500" handy. When one jar gets low and starts to thicken, I keep it and use it like regular putty, or somethimes use good ol' MEK to thin it and use it for texturing. Rob- I have to say, I have at least as much fun cobbling something together from parts as I do building a nice modern kit. Not only do I usually end up with a unique variant, I have more of a sense of accomplishment when I'm done. 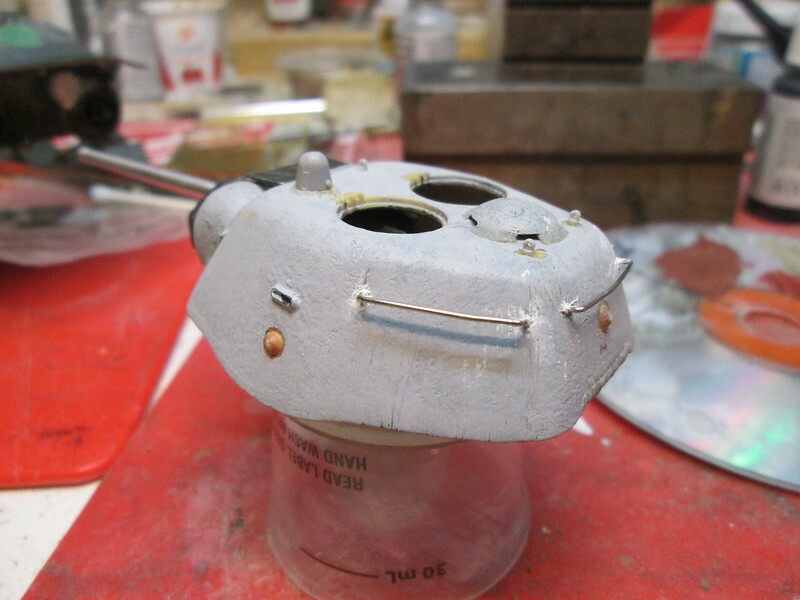 A bit more progress today: hand rails, small fittings on the turret and glacis, PE tie down loops, and I realized I should have filled the holes in the hull sides for the round side-mounted fuel tanks, so I started that too. 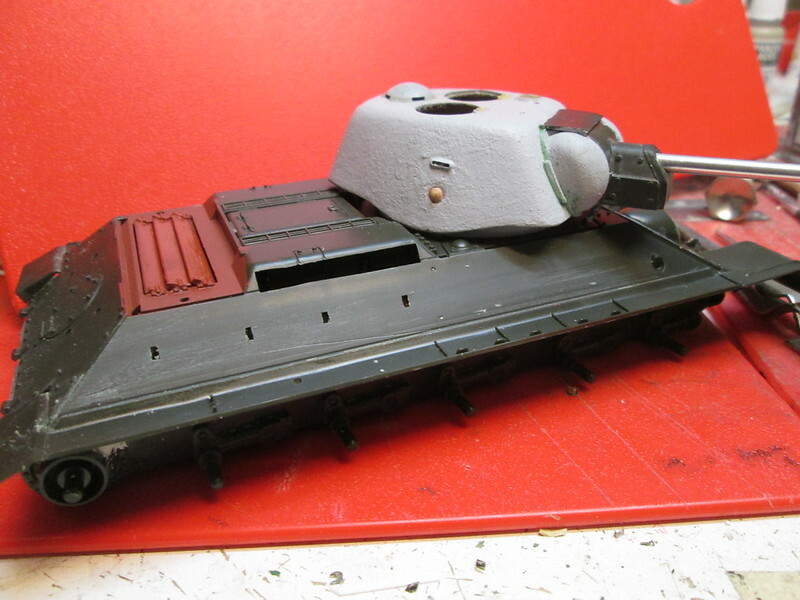 I imagine I have the hand hold configutation wrong for a Chtz tank, but I'm starting to get dizzy from trying to figure stuff out from pics. Very cool! 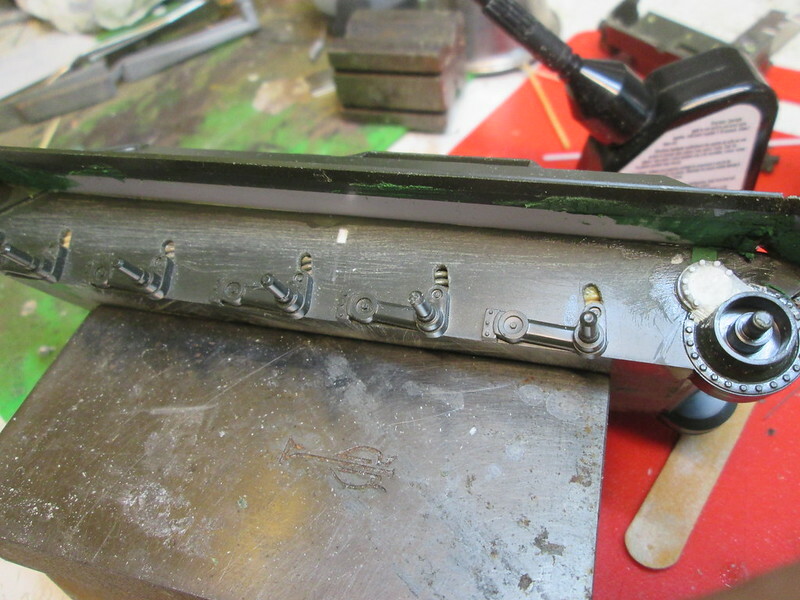 I too love the way you're doing the texture on the cast metal sections. Must have missed this update- she's coming right along! You're a better man than I with those teeny-tiny PE brackets on the right hull. I'd have gotten maybe a third cemented to the model and half of those crooked. One third would be cemented to my shirt and the last third lost to the carpet monster. It's all about the Optivisor and some teeny tweezers, and bracing the hand that has the part in it. These were actually not bad, it was the headlight mount that gave me fits. Oh happy day! 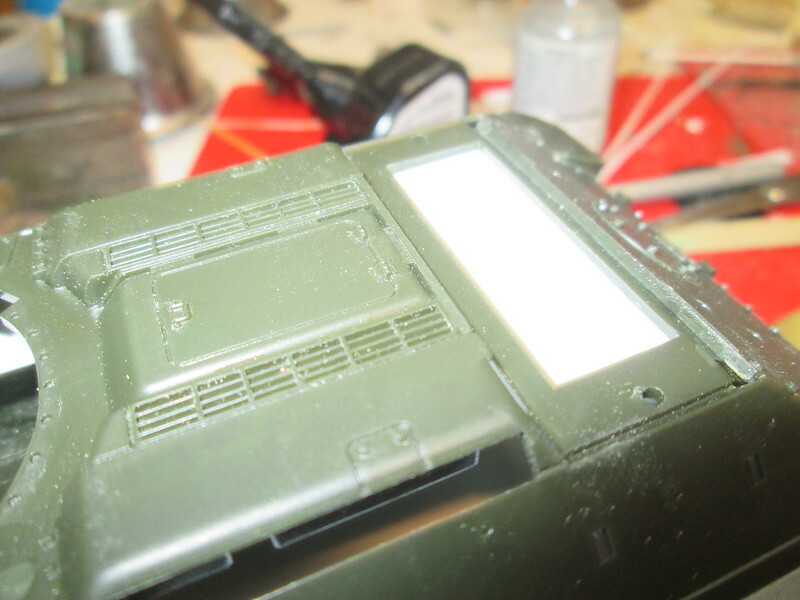 I went ahead and used the late style box fuel tanks, did the rest of the small bits and shot paint, a light primer first to find boo-boos, then green. And since I was there, I went ahead and did one run of tracks. I do enjoy a good set of Friuls. Wow. That's coming along quite well! 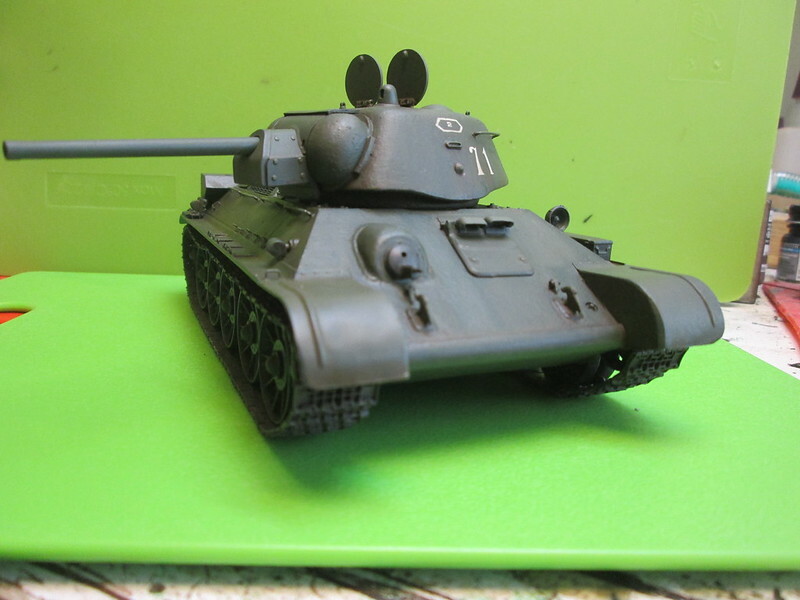 You've done an excellent job so far for a part box tank! T'anks all! 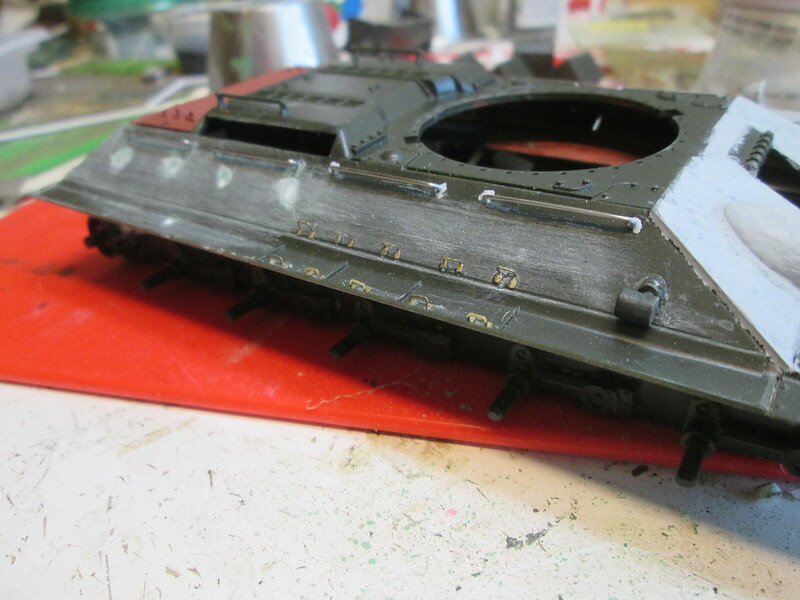 I did do the other side of the tracks, and then got back on my latest Magach, more later on both, as soon as I'm home. 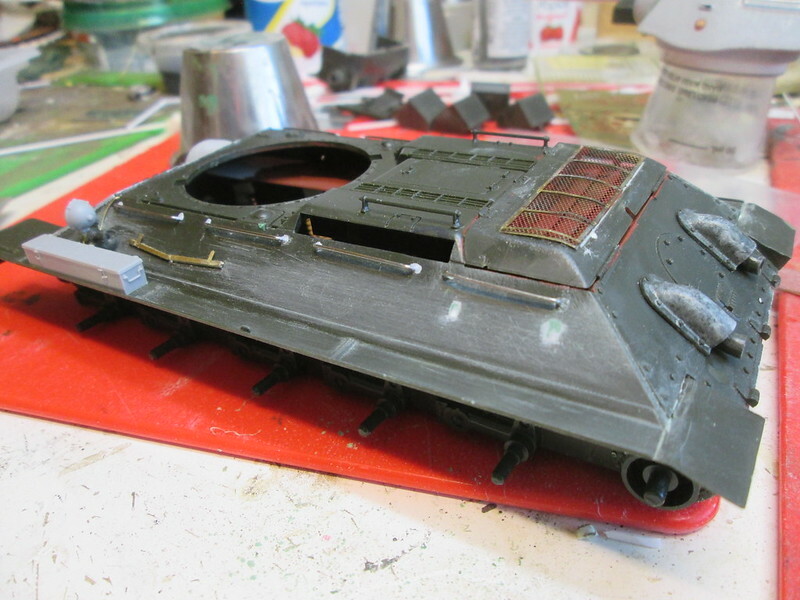 Wash is on, Vallejo dark green, and some highlighting started. 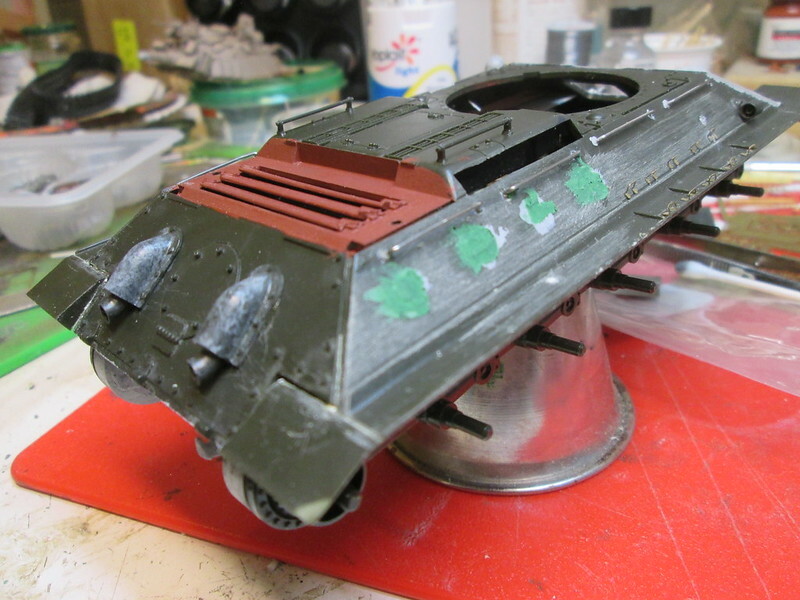 I'm rooting around now for ideas on turret markings, something to give this thing some contrast. It's starting to look more like 4BO green now, at least. A lightning and/or a catchy slogan in Russian or Ukrainian would fit here just perfect... Finding a reference on something like that is the tricky part - how realistic/accurate do you want to be? Sorry, I don't speak or read Russian so ya got me on a slogan! Looks good to me! Simple and sweet. You are doing a bang up job. I know when I give life to a kit that was given up on and probably destined for the landfill, I have a certain affection for it. I know it might not be the best build, nor the most accurate, but I completed a nice model out of virtually garbage! G, that's the plan, simple and clean. Rob, thanks, and I really do get a kick out of building something from what other people might consider junk. So, I did some more dirty washes, now just have to do a small amount of dusting and some more detail painting, and I'll call this one done. 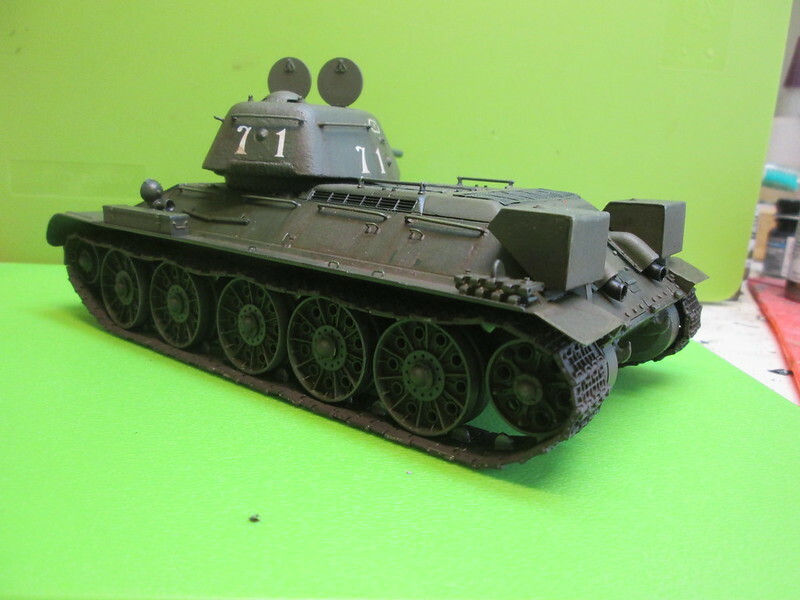 I picked up a couple of junk lots off of eBay, one with pieces of a Dragon Pz IV and the other of a T-34/85. 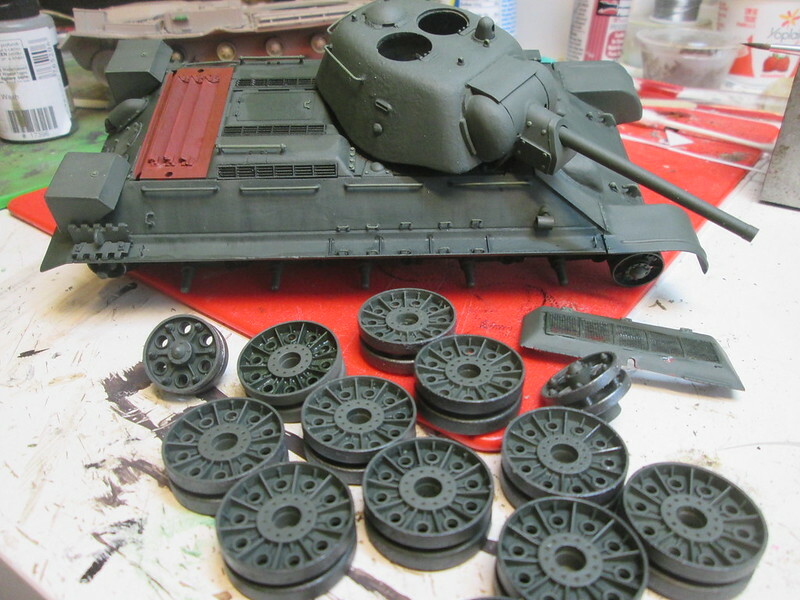 Between the two lots, I have enough parts for two tanks. And I'm not using a new kit to practice some new techniques on. 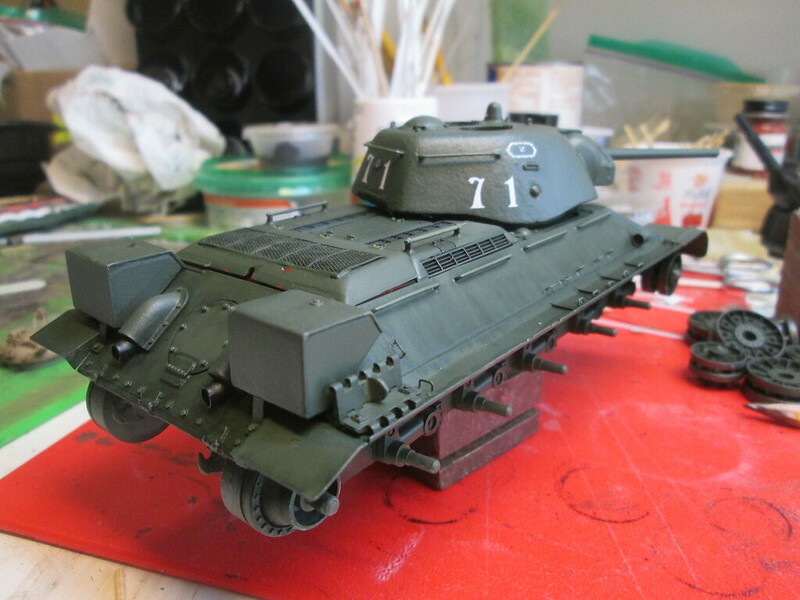 Rob: Another good reason to have fun with old kits. Cliff: Thanks! Finished pics on the way.